Let me take you to the English town of Woking, in Surrey, to the south-west of London. Here, you can find a trio of buildings sporting some glamorous 1930s Art Deco/Streamline Moderne styling, none of them particularly well-known to the wider world. It’s a timely visit because each year, the least well-known of the three opens its doors as part of the Heritage Open Days project, and the event took place again a couple of weeks ago. The three buildings are Woking signal box, Woking station, and the Woking Electrical Control Room. All three were constructed as part of an Art Deco splurge by the Southern Railway, which rebuilt many of its stations and signal boxes in the 1930s alongside a wide-ranging electrification programme. Under its chief architect James Robb Scott, the Southern Railway adopted Art Deco’s Streamline Moderne as its signature style. 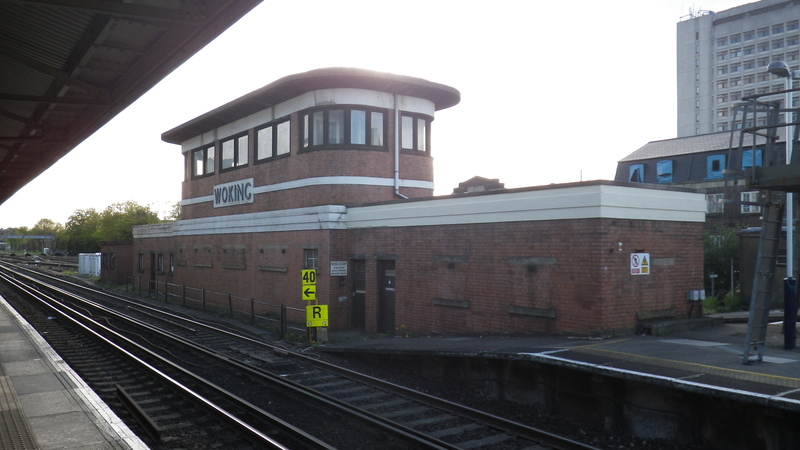 In an earlier entry we looked at some of the Southern Railway’s Streamline Moderne signal boxes, including the one at Woking. But it’s a super piece of industrial styling, so it’s worth seeing again. 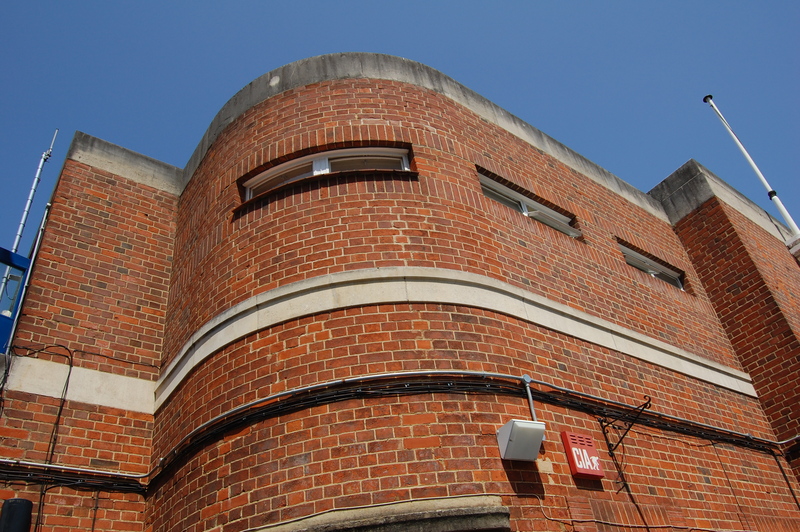 If Woking signal box is not a widely known Art Deco / Streamline Moderne building, Woking station and the nearby Electrical Control Room are even less so. Woking is a railway town. You can tell this because the station is the wrong way round. When it was built, the town of Woking (such as it was) stood to the south of the railway, so on this side the main ticket hall and station buildings were constructed. The north side had only a small entrance. Over the following years, the presence of the railway was the catalyst for the town’s growth, and the main commercial centre and most of the housing is now to be found to the north of the station on what had originally been undeveloped land. Because the station retained its original footprint there was never space to enlarge the station entrance on the north side. An impressive glass and steel canopy was erected over the north entrance and the road outside in 2007, to give the station a bit more visual heft on the town side. However, it’s still clear that although Woking’s economic activity is focussed to the north of the railway, the station’s own focus is on the south side of the tracks, where the main station building can be found to this day. The station building is of brick construction, with concrete dressings and steel windows. 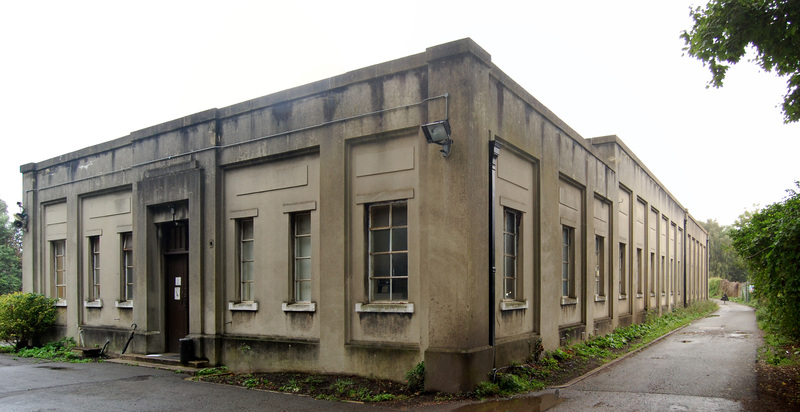 The main part of the station building is two storeys high with a concrete parapet. It features a projecting central section flanked by two wings with half-curved ends. 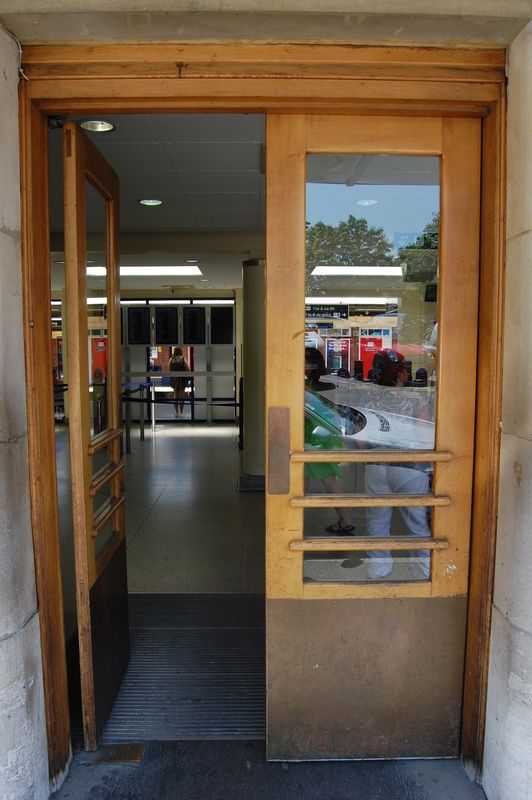 A curved canopy sits above three double-leaf doors, which are contained within a tall moulded concrete door and window feature. Two decorative metal poles with triple strap-like fixings flank the central windows. Further out (and not visible in the photo above) are single storey wings which make right angle turns before finishing also with half-curved ends. It’s not listed (one of the reasons why it is tricky to find out the exact date of its reconstruction and whether Scott was definitely responsible). This is fortunate for current operators South West Trains as they don’t have to worry about the various excrescences, like metal conduits and burglar alarms, which currently spoil the building’s appearance. On the platform side, the footbridge over the tracks has concrete smoke deflectors to prevent smoke from steam locomotives staining the pale render, an example of the modern electric railway dealing with the legacy of steam technology which remained in use for destinations beyond the electrified network. They’re still there today, deflecting the smoke from passing heritage steam trains (you can see them in this photo). The Southern Railway’s Streamline Moderne buildings also became known as ‘Odeon Style’ buildings, after the cinema chain which also employed Streamline Moderne as its signature architecture style. One of the games you can play with the Southern Railway’s Odeon Style stations is to find the actual Odeon cinema they most resemble. In the case of Woking, it’s probably Radcliffe in Greater Manchester. 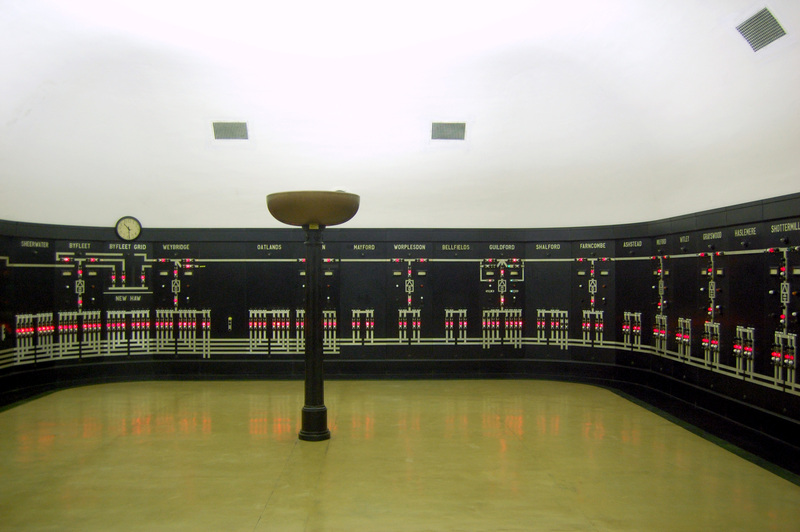 Meanwhile, even less well-known than Woking station is Scott’s nearby Electrical Control Room – this is the one that opens its doors once a year for the Heritage Open Days weekend. If ever you wanted to produce a film about a secret British rocket mission to the moon in the 1950s, it would make the perfect control room set. Happily, if that’s what you want to do, you can hire Woking Electrical Control Room, because it’s one of the locations that owner Network Rail makes available to film companies, as you can see here. Most notably, the room is lit by huge uplighters; giant copper dishes on top of decorative cast iron poles (the only cool things in what could be a very hot room during summer months, said our guide). They are every bit a match for Charles Holden’s similar uplighters on the London Underground, yet the latter are famous, while Scott’s are virtually a secret. The floor is polished lino (I believe), yellowish in the middle with green and black bands running around the outside edges. That’s what I call attention to detail (and it’s a design feature which is repeated in ceramic tiles around the poster frames at other Scott stations, including Surbiton). There’s no particular reason for this Art Deco styling and splendid attention to detail. This is not somewhere that would ever have been seen by members of the public in the normal course of things. It could have been made purely functional. Scott must simply have been proud of his company, and felt that its employees deserved the same architectural care and consideration as its passengers. 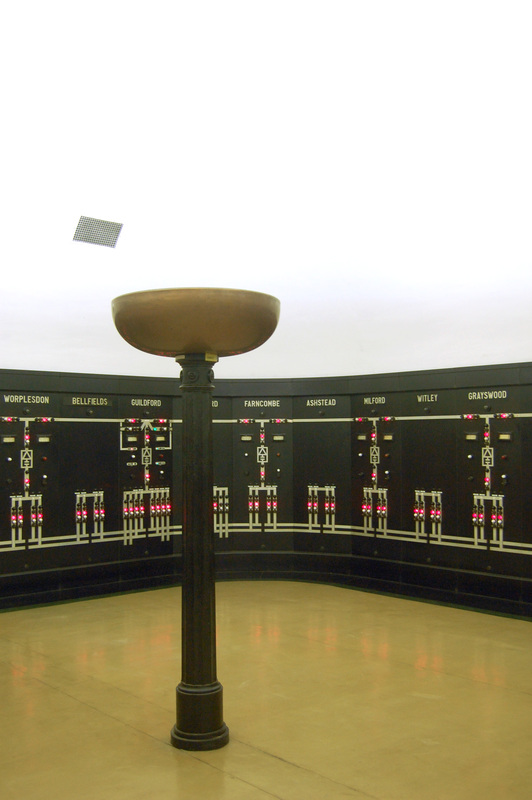 There were four other similar control rooms elsewhere on the Southern Railway, although two (such as the one at Three Bridges) have been lost. Woking’s should be around for longer because English Heritage gave it listed status (at Grade II) on closure in 1997, which will help protect it. It’s well worth a visit, although you’ll have to wait for the open day in September 2014. Woking Electrical Control Room is nearby, but parts of the building are still in operational railway use so it’s not normally publicly accessible. 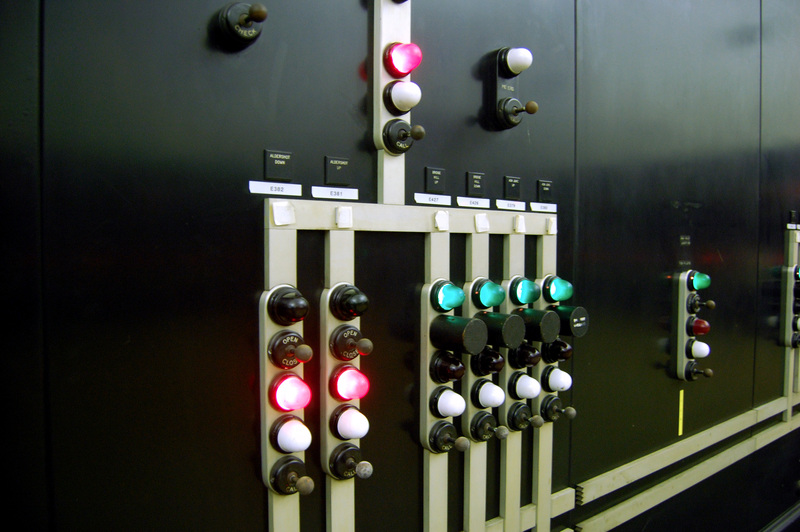 Great to see photos of Woking Control room again, brings back good memories. I ended as assistant operator in 1970 and moved to the Netherlands. Do some of the other lads ever react? Thanks for getting in touch. No, I haven’t had any of the other operators get in touch (though they were very helpful in person on the open day last year). Not sure if you ever make it back to the UK, but if you’re around next September, it might be worth popping in to the Heritage Open Day and saying hello.